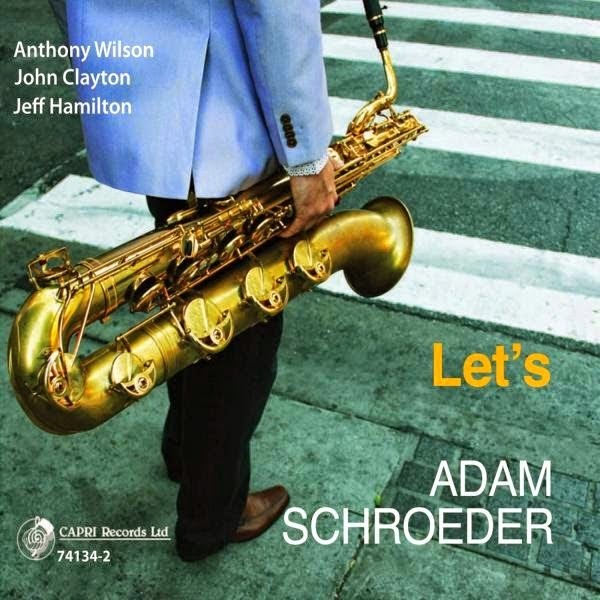 bebop spoken here: CD Review: Adam Schroeder - "Let's". Adam Schroeder (bar); Anthony Wilson (gtr); John Clayton (bs); Jeff Hamilton (dms). Just in case you'd begun to think, as I had, that Gary Smuylan and Ronnie Cuber were the only living giants of the baritone saxophone playing in the mainstream tradition, along comes this CD by Adam Schroeder that has just knocked me for six. A mix of originals (by Schroeder), standards ancient and modern and a couple of jazz repertoire pieces make this a must for baritone players and lovers of jazz without complications. Duke Pearson's Hello Bright Sunflower, Sam Coslow's In the Middle of a Kiss, Stevie Wonder's You and I, Wrap Your Troubles in Dreams, Thad Jones' Let's and Benny Carter's Southside Samba intermingle with Schroeder's originals which include the intriguingly titled A Hawkeye, A Hoosier and Two Call Cats and an unexplained tribute to Smulyan - The Smulyan Spectacles. Without doubt Schroeder has "arrived" just as Clark Terry forecast he would when he first heard him - "Check him out! He's bursting on the scene." Or as Clint Eastwood told Adam (obviously in Dirty Harry mode) "Beautiful, beautiful. I love the way you play that cannon!" Whether standard or original, Schroeder never fails to hit on a meaningful, melodic phrase rather than just running the changes which, of course he is also doing at the same time. However, it must be said that this ability isn't unique to Schroeder. Guitarist Wilson reveals that he too has a bag of tricks to match his leaders melodic awareness. Clayton and Hamilton, away from their big band setting boot things along swinging joyfully making this an album of sheer delight. Schroeder said that the title of the album "Let's" is about the four of us and, hopefully you too, just having some spirited, jovial and serious fun." Adam Schroeder - "Let's". is released by Capri Records on June 17.